Summary: Walter is a present-day litterbug with futuristic optimism grounded in his love for science fiction (SF). He doesn’t bother to recycle and sneers at Rose next door who has asked for a tree for her birthday. Then a dream has his bed traveling through a series of scenes in the future. Walter doesn’t find the SF-infused future he longs for but a polluted, trashy, and treeless future instead. Walter wakes converted and immediately begins sorting the trash. He even asks for a tree for his upcoming birthday. Later he has another dream with a revised future in which he and Rose’s 2 trees thrive under a clear sky, thanks to the behavioral changes humans have made to preserve the environment. Hanna’s Comments: Though this message is heavy-handed, its simplicity will speak to children who, for developmental reasons, tend to view controversial issues such as environmental issues like climate change with black & white tones. As expected from Van Allsburg, the illustrations are striking and offer much potential for conversation about our God-ordained role in environmental concerns and God's hope for our planet and all its creatures. I recently heard an interview with biblical scholar and seminary professor Ellen Davis on On Being, my favorite podcast. Dr. Davis and host Krista Tippett discuss Genesis 1:26, where we read the command God gives humans at their creation. Dr. Davis explains that the verb in the Hebrew language that has traditionally been translated "to have dominion" actually means "to exercise skilled mastery." She describes this act as a sort of craft or art in which we are privileged to have responsibility for our earth. [Here's] the link to that interview entitled The Poetry of Creatures. Fascinating and inspiring because along with it you get to hear some of Wendell Berry's beautiful poetry! 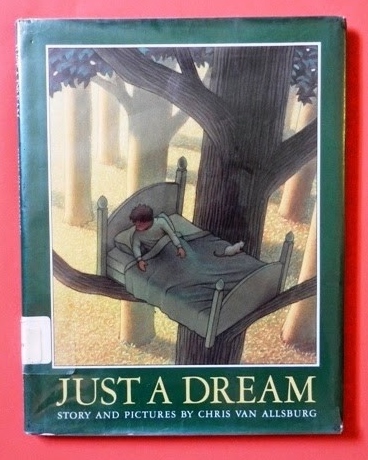 Idea(s) for Application: Read this book to a group of children in a private school’s Arbor Day program or at a kickoff for a church’s recycling program.